The 2010 Roush Mustang continues to be offered as several performance upgrade packages. One is the 427R which include Roush Front fascia with driving lamps, front chin splitter, side rocker splitters, rear valance, rear decklid spoiler, fender badges and rear decklid emblem, front windshield banner, and 427R striping kit. Additional options include: Roush exhaust, quarter window louvers, interior upgraded seats with suede, 20 inch cast chrome wheels and tire upgrade, short throw shifter with white knob, and illuminated door sill plates. Red Candy 2010 Mustang Roush 427R coupe with a black interior and a supercharged 435 horsepower engine. It has 18-inch Roush cast chrome wheels, high-performance Cooper Zeon tires, and an updated suspension. Performance White 2010 Mustang Roush 427R coupe with Roush body panels, Roush wheels and brakes, blue hood and side stripes, rear wing, and a 435hp supercharged 4.6 liter V8 engine. Here is a Grabber Blue 2010 Roush 427R supercharged coupe with red stripes, Roush body kit, rear quarter window louvers, rear wing, Roush wheels, and Roush custom interior. The color combo matches a version of the 2010 Mustang Shelby GT500. Brilliant Silver 2010 Roush 427R Mustang 435hp 4.6L supercharged coupe with Roush front fascia with driving lamps, front chin spoiler, side rocker splitters, rear valance, rear decklid spoiler, front windshield Roush banner, black 427-R side stripe, supercharged black hood stripe, 19 inch cast chrome wheels, Roush interior accents, and Roush suspension. Check out this Torch Red 2010 Roush 427R Mustang convertible with a ROUSHcharged 435hp 4.6L V8 engine, Roush custom body panels, Roush 20inch custom wheels, Roush handling, and custom Roush interior. This is a Sassy Grass Green 2010 Mustang Roush Barrett Jackson coupe which is just one of the custom 25 colors available for this limited edition special model. Limited to 25 cars, custom exterior paint, custom exterior stripe color, 540hp R2300 ROUSHcharged 4.6L V8 under the hood, 20 inch chrome wheels, high-performance Cooper RS3 tires, and a complete Roush handling package. Big Bad Orange 2010 Mustang Roush supercharged Barrett Jackson coupe. This is one of 25 limited edition special models which all come in custom paint. It also has 540hp under the hood and all of the Roush special handling. Limited Edition Yellow Jacket 2010 Mustang Roush Barrett Jackson coupe with 540hp under the hood. Besides the power this special Roush model features custom paint colors and is limited to 25 cars. Roush 2010 Barrett Jackson Mustang coupe in a custom black exterior paint. Limited to 25 Mustangs, they all come in custom paint and have 540hp under the hood. Blisterin Blue 2010 Mustang Roush Barrett Jackson limited special edition coupe. This is one of 25 limited edition Roush Mustangs which feature a set of wild colors, based on the Roush Stage 3 upgrade package, which includes a 540hp engine. 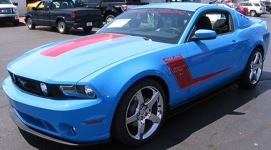 We have other 2010 Barrett Jackson limited edition Roush Mustangs on this site. This is a Black Cherry pearl Barrett Jackson limited edition Roush Mustang coupe which features a wild color, Stage 3 upgrades, a 540hp engine, and special badging. Limited to 25 cars this is just one of the custom 25 colors available. We have many photos of these special models.